Surface troughs generated storms and showers in northern, central and eastern Australia, while a series of cold fronts and associated low pressure systems produced moderate fall in the southeast. 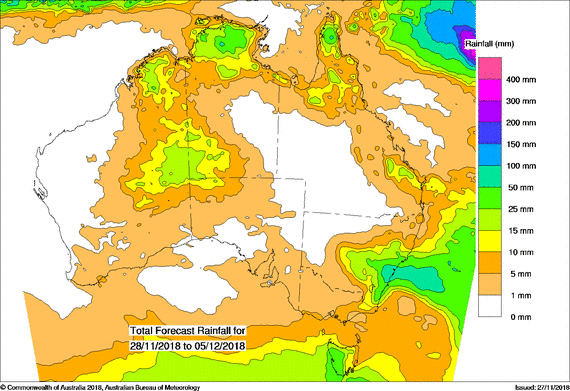 Past seven days: A weak cold front resulted in light to moderate falls in southeast Australia at the start of the week, broad surface troughs across northern Australia produced thunderstorms and showers with moderate falls. Moderate rainfall was mainly recorded in the Kimberley and eastern parts of the Southern Interior of Western Australia; the northern half and southwest of the Northern Territory; western and central to southeastern Queensland; parts of central and eastern New South Wales; eastern Victoria and parts of central and eastern Tasmania. Scattered, light falls were recorded in all States and Territories.